Web Wiz Review 2019: Is Web Wiz a Good Hosting? Web Wiz specializes in Windows hosting and offers affordable entry-level Windows shared hosting products. With lots of Microsoft-specific support and tons of ASP.NET components standard, this host is worth checking out for most personal and small business websites. Web Wiz prides themselves on being an eco-friendly web hosting provider and has been providing services globally since 2001. They specialize in Windows hosting and are an excellent option for both beginners and experienced webmasters looking for reasonably-priced Windows hosting. This U.K.-based provider owns and operates their own Tier 2 data center located in Poole, a coastal town in Dorset, southern England. One thing I like about this provider is that your database storage is separate from your primary storage. If you need more storage, you can also get 500MB of extra storage for a fee. If you need robust MS Access support, this is an excellent option as they offer unlimited MS Access databases. Each plan has numerous ASP and ASP.NET components installed, including AspPDF, ASP.NET AJAX, LINQ, and many more. A full list is available on the website. That said, two things I don’t like about these plans is that you don’t get a free domain registration and that you have to pay extra for SSL certificates. If you’re a beginner, you’ll have a bit of a learning curve because they don’t offer a website builder. You can install WordPress and other apps using the Microsoft Web App Gallery though. Otherwise, they offer a hosting cPanel that you can use to manage your website. Except for the Basic plan, all plans offer a decent amount of storage relative to the number of domains you can host. Unless you have a super basic website, I’d go with at least the Standard plan because you get more storage for a single website along with unmetered bandwidth. Pricing for this host is average compared to other Windows shared hosting services, and that pricing gets better the longer you sign up for. If you opt for an annual plan, you get 12 months for the price of 10. All plans come with a 30-day free trial. However, SSL certificates are not cheap: Basic and Standard users that need an SSL certificate should plan on paying the equivalent of a year’s hosting. Web Wiz offers decent support via phone, tickets, and an active support forum. They don’t provide live chat support. There is a knowledge base, but it’s somewhat limited. The support forum seems to be your best bet for help outside of phone support as there are nearly 20,000 topics to search through – alternatively, you can start your own support thread. If you’re looking for entry-level Windows shared hosting services, then Web Wiz is definitely worth checking out. With robust database support, unlimited MS Access databases, and pre-installed ASP.NET components standard, this is a great host for both beginners and experienced Windows hosting webmasters. 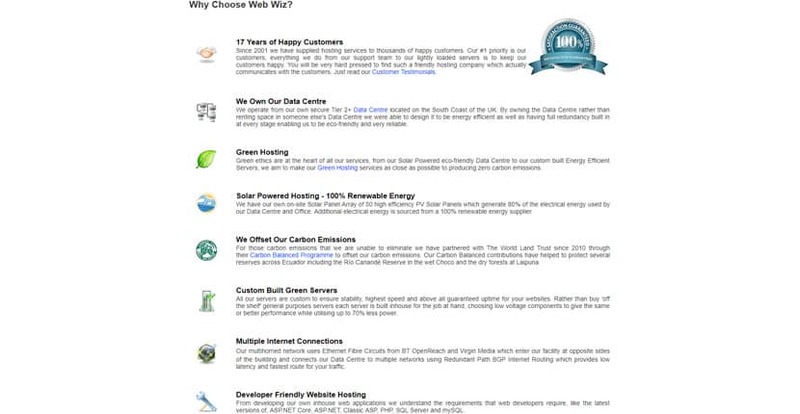 Wondering how Web Wiz stacks up against other Web Hosting companies? Enter any other Web Hosting company and we will give you a side-by-side comparison.